Victoria Falls are formed as the Zamezi River plummets into a 108 meter high cleft. The falls drop into a deep, narrow chasm, which is connected to a long series of gorges. Just stunning! Victoria Falls is one of the Seven Wonders of the World as it stretches 1.7 KM across and is shared by two countries, Zambia and Zimbabwe. The falls are formed as the Zamezi River plummets into a 108 meter high cleft. 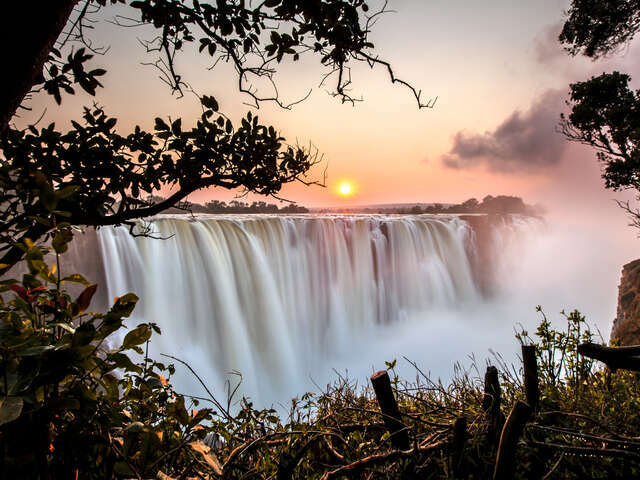 The locals call the falls Mosi-oa-Tunya meaning ‘Smoke that Thunders’ because during the wet season the spray from the falls can be seen nearly 50 KM away. The falls drop into a deep, narrow chasm, which is connected to a long series of gorges. This unique form allows the falls to be viewed face-on 60 meters away from the opposite side of the gorge. Victoria falls is a must-see on many bucket lists as it is known as the greatest curtain of falling water in the world. The Falls are stunning from many angles, and some of the best views are from the Knife-Edge Bridge, where visitors can have the finest view of the Eastern Cataract and the Main Falls as well as the Boiling Pot, where the river turns and heads down the Batoka Gorge. Other great vantage points which offer spectacular panoramic views across the Main Falls include Falls Bridge, Devils Pool and The Lookout Tree. Interested in experience Victoria Falls for yourself? Ask us for help in booking your African adventure.